Note : If you can get fresh lemon grass, galangal (thai ginger) and kaffir lime leaves , then it is perfect for this dish, if not, you can still go ahead and make it using the ready made Tom Yum Soup Paste ( which already includes these ingredients !) which is easily available in most Asian food stores. Pour 5 cups of water in a big dish and bring to a boil. Add the chicken/shrimp stock cube and boil for additional 2 mins. 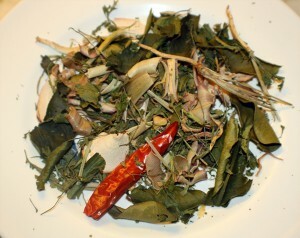 Add the sliced lemon grass, galangal and, kaffir lime leaves and boil for 3-4 mins. 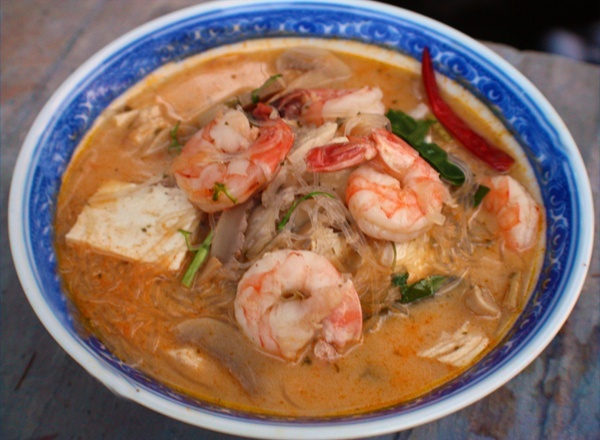 Add the Tom Yum Paste to the soup and add the sliced chicken and cook for 4-5 mins till the meat gets tender. Add the coconut milk to the soup and the chillies. 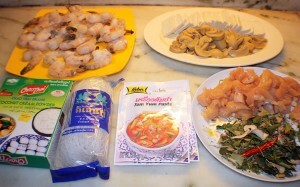 Lastly, add the prawns, mushroom, tofu and glass noodles and cook for 4-5 mins. Add the fish sauce and adjust the seasonings to your taste. This entry was posted in All Recipes, Chicken, Fish, Sea Food and tagged Tom Yum Soup by Kamakshi. Bookmark the permalink. You can certainly see your skills within the paintings you write. The arena hopes for even more passionate writers such as you who are not afraid to say how they believe. At all times follow your heart.